(CNN) -- Fog, low winds and cool ocean air were giving firefighters hope Saturday that the wildfire that has ravaged parts of Southern California for days may be coming under control. 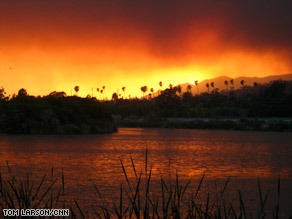 Smoke from a wind-fueled wildfire casts a glow over Santa Barbara, California. "I think everybody could feel the difference today," said Santa Barbara County Fire Chief Tom Davis, citing cool breezes from the ocean, increased humidity and a lack of heavy winds. "All of those together really gave us the opportunity to get in there and make a difference." The fire, which began Tuesday, has scorched nearly 9,000 acres and destroyed or damaged about 80 homes and businesses in the foothills of the tony coastal region around Santa Barbara, authorities said. Nearly 50,000 people have been evacuated from their homes and 13 people, all of them firefighters, have been injured. Davis said that by 5 p.m. (8 p.m. ET) Saturday, about 30 percent of the fire was contained, with firefighters continuing to make progress. iReport.com: Are wildfires affecting you? "I would expect at the morning meeting you're going to hear a different number than that -- a better number than that, a bigger number," he said. "The fog has helped the fire to lay down," said Deputy Chief Chris Hahn of the county fire department earlier in the day. "Overnight, fire activity has been fairly inactive actually because of this." "However, just because the weather is better doesn't mean we're out of the woods. The weather tends to be a little fickle around here." Authorities say they still do not know the cause of the fire. The blaze comes about six months after another wildfire -- the so-called Tea Fire -- destroyed about 200 homes in the area. The winds that began blowing around sundown Thursday topped 50 mph. About 30,500 people in Santa Barbara County have been evacuated because of the fire, and at least 23,000 more are in an "evacuation warning" area. More than 12,200 homes or businesses are in the mandatory evacuation area. "We're doing everything we can to get people back into their homes," Hahn said. "One of the major priorities is getting people back in. But the thing that trumps that is their safety, and that is what we are working on right now." Thirteen firefighters have been injured, Hahn said. The cause of the fire is unknown, and authorities are asking anyone with information on its origin to call a tip line. The blaze comes about six months after another wildfire destroyed about 200 homes in the area.